If you own an aircraft and are not utilizing it as much as you would like or if you would like to try and recover some of the cost of owning the aircraft, you may have thought about renting your aircraft to other pilots. As a practical matter, that makes some sense. But before you actually rent your aircraft to another pilot, here are a few things you should consider. It is important to understand that the FAA does not prohibit aircraft owners from renting their aircraft. In fact, the regulations specifically contemplate rental arrangements. So, renting your aircraft is permitted, provided that you comply with applicable regulations. The FAA provides guidance on what is and isn't a permissible rental arrangement in Advisory Circular 91-37B Truth in Leasing (although truth in leasing requirements only apply to large civil aircraft, the general lease concepts discussed in the AC apply to leasing arrangements for all aircraft). Most aircraft insurance policies will extend coverage to other pilots who fly your aircraft provided that the pilots are either expressly identified in your policy or if they have the necessary experience/qualifications to meet the "open pilot" clause of the policy. However, if you are going to charge the pilot for use of your aircraft, you need to confirm that your policy allows you to rent or lease your aircraft to a third-party. Most aircraft policies issued to owners for personal/business flying do allow aircraft leasing, but it is important to confirm this with your insurance underwriter. Also, rather than paying to obtain their own insurance policy or renter's insurance to cover their use of your aircraft, most renter pilots will want to be named as an additional insured under your policy as this can oftentimes be done at no cost to you or the renter pilot. In that case, renters will typically ask for a certificate of insurance that reflects not only that they are added to your policy, but that they are covered for their operation and use of their aircraft. This is important because it doesn't do the renter pilot any good if he or she is added to the owner's policy but only covered for the owner's operation of the aircraft, rather than his or her own use. In most states, when an aircraft owner rents an aircraft to a third-party the owner is required to collect and remit sales tax on the rent paid by the third-party for the aircraft. If you are in one of those states, in order to rent your aircraft you will need to obtain a sales tax number so you can collect and remit sales tax to the taxing authority. This is the aircraft owner's obligation and the taxing authority will hold the aircraft owner responsible for any sales tax the taxing authority believes the aircraft owner should have collected and remitted, regardless of whether the renter pilot actually paid the sales tax to the aircraft owner. Also, when you rent your aircraft many taxing authorities view that activity as commercial activity which then means your aircraft could be subject to assessment of personal property tax on the value of the aircraft, or some portion of the value based upon the pro-rata rental versus personal use of the aircraft. 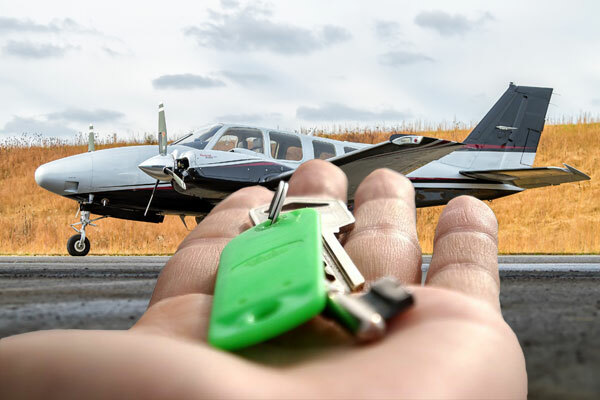 Although not all states assess personal property tax on aircraft, if you are in a state that does you will want to determine your potential property tax exposure before you decide to rent your aircraft. Although you will also have other things to consider as you decide whether to rent your aircraft to other pilots, these three issues should be near the top of your list. And if you understand and address these issues up front that will help ensure a successful aircraft rental experience for both you, the aircraft owner, and your renter pilot. As we get to the end of the year, many aircraft purchasers and sellers are trying to get their deals closed. Whether for tax or other reasons, year end is a busy time for aircraft transactions. Many transactions are closed using escrow agents located in Oklahoma City, Oklahoma (home of the FAA Aircraft Registry). If you have never been involved in an aircraft transaction, you may wonder what happens at an aircraft closing. The escrow agent, as the seller’s professional user entity, discharges any registration by seller with the International Registry of any international interest or prospective international interest registered with respect to the aircraft, and consents to the registration of the sale of the aircraft to the purchaser. The seller and purchaser usually intend that each of these actions is interdependent with each of the others, but that upon completion they are considered to have occurred simultaneously. When all of these steps are completed, the seller delivers physical possession of the aircraft to the purchaser at the closing location. This closing process may occur via a telephone call with all of the interested parties on the line, or simply after each of the interested parties has provided authorization (usually via e-mail) for the escrow agent to perform these steps and close the transaction. And, of course, depending upon the transaction, these steps may vary. But this is generally how the process occurs. If you ever have questions or need assistance with an aircraft transaction or closing, I would be happy to help. And in the meantime, Happy New Year. Retail Owners: BUY, SELL or HOLD? As an inventorying-dealer, we are often asked by aircraft owners “Does it pay to make a move now? The truth is, whenever you buy or sell an asset, there are unavoidable costs associated. Selling a home can be one of the best examples of an expensive transaction with often little monetary value gain. Moving costs, furniture damage, endless time spent cleaning/showing the home, agent commissions often eat up your anticipated fortune. An aircraft transaction however, has an overwhelming amount of justified reasons to invest. Whether for business or for personal use, aircraft as we all know are time machines which can also bring value to an owner’s employees, their families, the employee morale at a distant store or a face-to-face meeting with a vendor about an issue. I would even argue the efficiencies a properly advised owner can create during a transaction can make for large gains in monetary value at times. No, I’m not suggesting you go buy a Falcon 10 and wait for the market to rise, however there ARE opportunities in this current active market, to make smart financial gains in your aviation transaction both for the short-term & long. Whether it means you are a new private pilot moving up from your first 172 to a faster Cirrus, or whether you are a large corporation looking to sell your Citation XL and get into a large-cabin Falcon, I believe this is a good time to move! With pre-owned aircraft inventories shrinking daily & firming prices, we are already at pre-2008 inventory levels again and first-time buyers are entering the market which we haven’t seen in a decade. Only a couple years ago, we would commonly advise clients the selling would be the tough part, but the buying is easy. Now that is almost opposite in some late-model jet markets where buyers are waiting patiently for months at asking price while the seller tries to locate their new aircraft. What should you do? Get the advice of a trusted and seasoned professional. If you aren’t already working with a broker or dealer, I recommend starting your search for one at National Aircraft Resale Association From there you’ll have the freedom to rely on your broker’s market intel, along with your good business sense which likely allowed for you to buy an aircraft in the first place. Good hunting and God Bless. Chris is the Vice President of Meisner Aircraft who has served companies both small and large for over 30 years. They have built their reputation of providing good sound business advice for clients around the world. Whether it was a customer purchasing their first single engine aircraft or the larger flight department who needed a company with the experience and expertise to handle a complicated transaction process. Family owned and operated they have successfully been involved in over $900 million in aircraft sales. Does The “As-Is” Language In An Aircraft Purchase Agreement Make A Difference? It isn’t uncommon in aircraft purchase agreements to see language stating the parties are agreeing that the aircraft is being purchased “as-is” or “as-is, where-is.” Oftentimes the agreement will go on to also say that the seller is not making, nor is the buyer relying upon, any representations or warranties regarding the condition of the aircraft. And it may also specifically state that the buyer is only relying upon its own investigation and evaluation of the aircraft. But what does this really mean? Well, from the seller’s perspective, the seller wants to sell the aircraft without having to worry that the buyer will claim at a later time that the aircraft has a problem for which the seller is responsible. So, the seller does not want to represent that the aircraft is in any particular condition (e.g. airworthy). When the deal closes, the aircraft is sold to the seller in its existing condition without any promises by the seller about that condition. Here is an example of how this works: If the first annual inspection of the aircraft after the sale reveals that the aircraft is not in compliance with an airworthiness directive (“AD”) that was applicable to the aircraft at the time of the sale, the buyer could claim that the aircraft was not airworthy at the time of the sale and demand that the seller pay the cost of complying with the AD. But if the purchase agreement has “as is” language, then the chances of the buyer being able to actually force the seller to pay are low. Not only does this “as-is” language protect the seller, but it also protects other parties involved in the sale transaction such as seller’s aircraft broker. A recent case provides a nice explanation of the legal basis for this result. Red River Aircraft Leasing, LLC v. Jetbrokers, Inc. involved the sale of a Socata TBM 700 where the aircraft owner/seller was represented by an aircraft broker. The buyer and seller entered into an aircraft purchase agreement that included not only “as-is, where-is” language, but it also provided that the buyer was accepting the aircraft solely based upon buyer’s own investigation of the aircraft. During the buyer’s pre-purchase inspection of the aircraft, the buyer discovered certain damage to the aircraft. However, the buyer accepted delivery of the aircraft in spite of the damage based upon alleged representations by the broker that the damage was repairable. After closing the buyer learned that certain parts were not repairable. Rather than sue the aircraft seller, presumably because the buyer recognized the legal impact of the “as-is” language in the purchase agreement with the seller, the buyer instead sued the aircraft broker alleging that the broker negligently misrepresented the aircraft. In order to succeed on a claim of negligent misrepresentation under Texas law (the law applicable to the transaction), the buyer was required to show (1) a representation made by the broker; (2) the representation conveyed false information to buyer; (3) the broker did not exercise reasonable care or competence in obtaining or communicating the information; and (4) the buyer suffers pecuniary loss by justifiably relying on the representation. In response to the buyer’s claim, the broker argued that the “as-is” language in the purchase agreement waived the buyer’s right to be able to prove that it justifiably relied upon any alleged representations by the broker. The buyer primarily argued that the purchase agreement language did not apply because the broker was not a party to the agreement. But the Court disagreed with the buyer. the purchase agreement contains clear language evincing Red River's intent to be bound by a pledge to rely solely on its own investigation. And, because it appears that the parties transacted at arm's length and were of relatively equal bargaining power and sophistication, the court concludes that the language in the purchase agreement conclusively negates the reliance element of Red River's negligent misrepresentation claim. So, even though the broker was not a party to the purchase agreement, the Court still held that the buyer was bound by the statements/obligations to which the buyer agreed in the purchase agreement, even with respect to third-parties. As a result, the Court granted the broker’s summary judgment motion and dismissed the buyer’s claims against it. “As-is” language will continue to be common in aircraft purchase agreements. Aircraft sellers and those working with them will certainly want to include and enjoy the benefit from this language. Conversely, aircraft buyers need to be aware of the scope and impact of “as-is” disclaimer language in an aircraft purchase agreement. If a buyer is unhappy with the condition of the purchased aircraft, the presence of this language in the purchase agreement will significantly limit the buyer’s remedies and recourse. When it comes to making any large purchase, being thoughtful and thorough is of the upmost importance. This is true for homes, cars, and especially for airplanes. An airplane is an investment that will hopefully last you years, and absolutely must keep you safe to the best of its abilities when you fly it. In general, people are wary of where their large ticket items come from. They like to have a full description of the item that is without any deception or misinformation. Typically it is preferred to have a way to inspect the purchase up close, but with aircraft and other online purchases this may be difficult because it is located far away. One might be surprised to learn that in a Google search for “Aircraft for Sale,” eBay is one of the top results in the first page. Of course, when you search for any number of things followed by “for sale,” eBay also appears on the first page. They’ve been in the business of connecting sellers to buyers for 22 years now. While some may be quick to discount eBay as an unreliable or sketchy source for aircraft sales, there are certainly pros as well as cons to purchasing through their site. After consulting a few industry experts, reading online forums, and browsing the selection of aircraft for myself, I have come to the conclusion that you just might find a perfectly good aircraft listed on eBay. However, you may have to proceed with more caution than on specific “aircraft for sale” websites. Let’s break it down into the pros and cons. As mentioned earlier, the perfect deal is likely not sitting in your backyard. Aircraft can be list a few states away, and without having the ease of heading over to inspect it up close, you may end up buying it sight unseen. eBay did think of this, and you can hire the people are We Go Look to inspect your purchase for you, typically for less than $100. When you place a bid on eBay Motors, which includes all of their aircraft listings, the bid is non-binding. This simply means that your bid expresses interest in the airplane, but it is not a binding contract between you and the seller. That can be comforting when you want to get your foot in the door but you would still like to read over all the paperwork associated with the plane before you dive in with a purchase. Although eBay is not as big as it used to be, it does still have a large following. Some old-school aircraft purchasers still check the site, as is evident by the aircraft buyer forums I browsed. Having extra exposure across multiple buying platforms can help your aircraft get noticed and sold, which is the ultimate goal. Regardless of if you’re buying or selling, you must have your paperwork in order. Any purchase should still be contingent upon a title search showing clear title and a satisfactory pre-purchase inspection. If you opt to purchase it without a pre-purchase inspection, you are taking a risk that may not be worth it. Some of the most repeated advice for aircraft purchases is to be patient. It may seem like your dream airplane but being thorough with paperwork and inspections is vital. Another more practical way to utilize eBay is to purchase aircraft parts. You can find some pretty good deals on old parts that only need a little work to look new. If you look at the storefront for Universal Asset Management, you’ll be able to find authentic, rare parts from decommissioned commercial airliners. I found a Russian “EXIT” sign, a flight recorder, and a parking break panel. They have hundreds more treasures listed on their site that do not carry quite the amount of risk involved with purchasing an entire plane. You may find some hidden treasures. During my browsing of the eBay airplane listings, I also happened upon an advertisement for 10 hours PIC of multi-engine time in a Piper PA 30 Twin Comanche. In this case the seller is using eBay as a sort of classifieds, reaching a whole new audience that may be thinking about getting their Multi-engine add-on. This is a clever tactic and could be capitalized on if it isn’t against eBay’s terms and conditions!